Your air conditioner not only removes heat from your home, it removes humidity as well. During the sticky days of summer, it can take a lot of moisture out of your indoor air — and all that water has to go somewhere. Ideally, it collects in your air handler’s condensate drip pan, where it flows into a drain tube that leads outside your home. 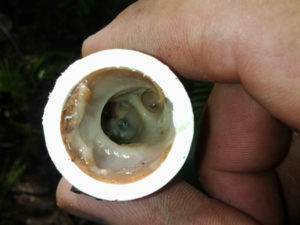 But this tube can become clogged over time, and that can lead to water damage. The water that collects in your air handler’s condensate pan contains microscopic bacteria and other tiny particles from the air. As it drips through the drain line, the water leaves behind a residue that can build up to form algae, mold and even wet clumps of dust and dirt. Since the drain line leads to the outdoors, it’s also possible that clogs can form from that end, as well. If the drain line exits in an especially dusty place, it could be clogged with a dirt clod. And if you haven’t used your air conditioner in a while, it’s possible that insects have built a nest in the opening. How Do I Know if I Have a Clog? When your drain line clogs up, what happens next depends on your air handler’s features. Many modern air handlers can detect when the drip pan is too full and respond by shutting down. The most sophisticated models can even send a text message or email when this happens. While this is an inconvenience, it’s better than the drip pan overflowing. If your air handler doesn’t have this feature, you might not notice a problem until you see water dripping through your ceiling or out of your vents. This means that the drip pan has already overflowed, and you should shut down your air conditioner immediately. How Do I Clear a Drain Line Clog? Clearing a drain line requires certain equipment, notably a wet/dry shop vac and possibly an air compressor. If your air handler is located in your attic, it will also require working up there, possibly in a tight space. If you you’re unable to do this or lack the equipment, you should leave this job up to an HVAC technician — it’s a quick emergency repair. If you want to try clearing it yourself, you need to start by locating your air handler’s condensate drip pan, which is usually at the bottom of the unit. Carefully slide the pan out (it may be full to the brim) and use a wet/dry vac to remove the water. Remove the pan completely and wash it in hot, soapy water to remove any buildup. Next, try to clear the drain line with suction or positive air pressure. You can try vacuuming the line from either end, but the challenge will be in creating a tight seal around the vacuum hose. You may need to experiment with different attachments or improvise by wrapping a rag around an attachment. Vacuuming will be more effective if you have a partner plug up the other end of the line. Alternatively, you can use an air compressor to blast air into the air handler’s end of the drain tube, in the hopes of blowing the clog out the other end. Once the drain line is clear, use a funnel to slowly pour a gallon of white vinegar through the tube. This will help kill any remaining mold and algae, and can help mitigate the risk of future clogging.